What makes it special? 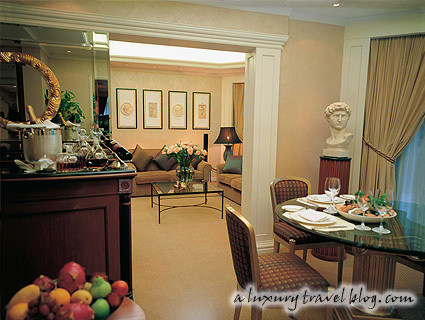 Presidential-style and the ultimate in both comfort and sophistication is the hallmark of the Premier Suite. 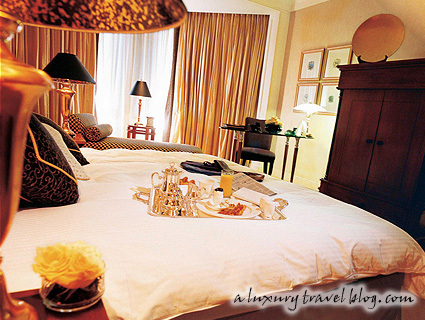 The Premier Suite is the ultimate in presidential-style living, a luxurious environment for the privileged guest. For the international jetsetter or senior corporate executive, the spacious living and dining area provides an ideal place for entertaining. Bold coloured silks and rich dark toned woods accentuate the softer shades of the drapes and seating. A silver leaf screen draws the eye to the dining area, which is complemented by a wooden column topped by a bust sculpture. Stone-carved bas-reliefs decorate the walls enhancing the rich flavour and feel of this luxurious setting. For that private meeting or simply a quiet corner to retire to, enter the study room. Welcoming armchairs, centered around a contemporary wooden fireplace and a large footstool, all in muted fabric tones, encourage thought and relaxation. A glass top desk provides executives with the very latest state of the art communication. The bedroom continues the theme of the suite with an imposing art piece mounted on a mirror in a specially finished frame presides over a contemporary central console. A large padded headboard reaches dramatically up to the ceiling and an oversize bed with sumptuous Egyptian cotton sheets beckons the weary traveler.